We have a school program and a series of events. In the superbly light and spacious main hall of Freedomlab, we gather around a standing table covered in brown butcher paper. 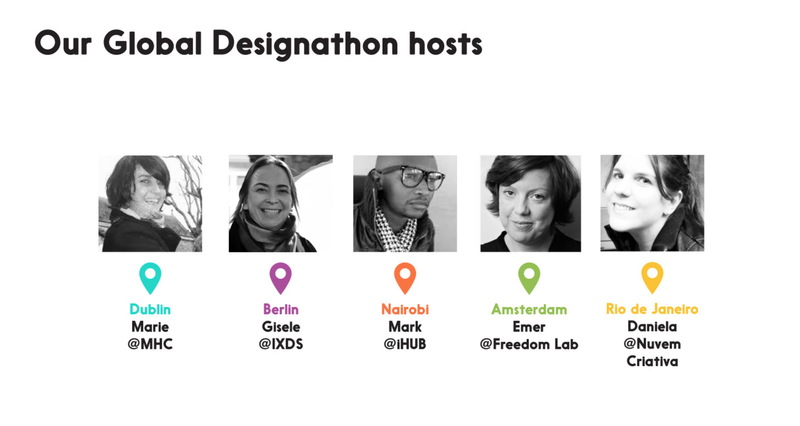 The doors are held open by a heavy piece of rail: the Amsterdam welcome of the Global Children’s Designathon has started. Emer Beamer, initiator of today’s gathering, is briefing her team of facilitators, bloggers and builders, whilst the video guy is quietly setting up his equipment in the background. A handful of children (mostly boys) are treating the sitting blocks as Minecraft material: building a green and purple cave home. In five locations in the world (Berlin, Rio de Janeiro, Nairobi, Dublin and Amsterdam) groups of 30 children aged 8 to 12 will be working in parallel. They will be designing and building their (tech) solutions for our worlds most pressing problems around food, waste and the future of mobility. 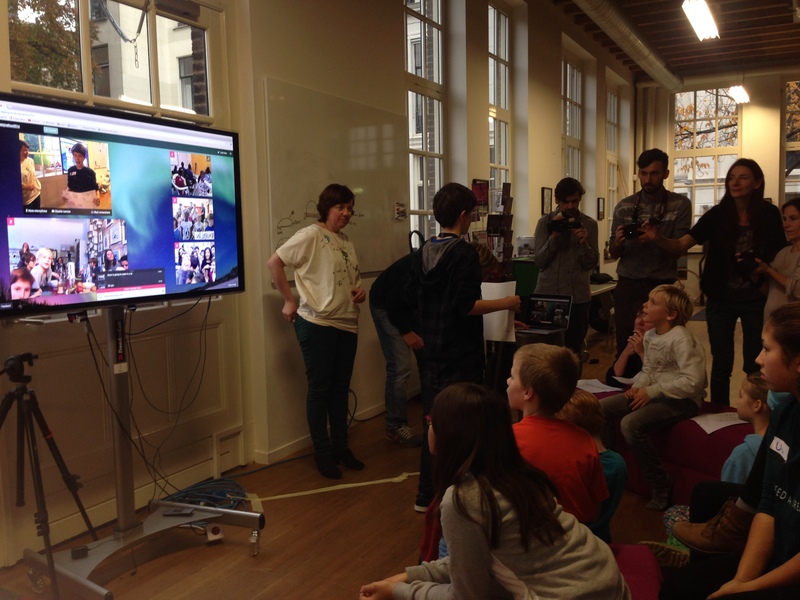 Unexpect – Where Children Design Better Futures Using New Technologies – has organised this day. 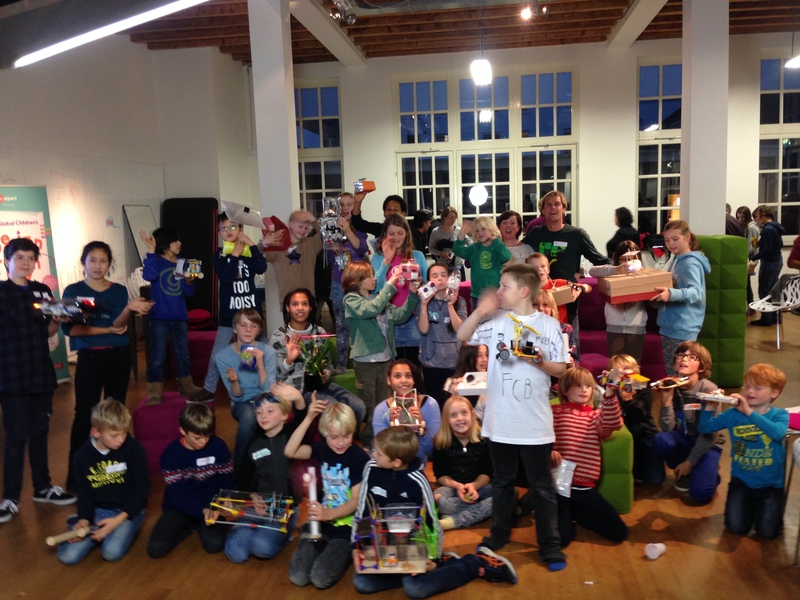 It is a one-day crash course in design thinking, new (exponential) technologies and societal problems, for children between 8 and 12. Because these kids can think, fantasise, dream, design and build. They actually care a lot about the issues we discuss today (we think). And they enjoy the sense of empowerment, the idea that they can come up with real solutions. In one day. Later today we will set up videoconferences with the other four locations. Teaching twenty-first century skills across three continents. Wow. Klaas’ introduction on the three themes already sparked some thoughts. “Today we will invent. You can invent something for a problem that you find important.” The kids (re)learn that ‘waste’ actually does not exist. It is just stuff, that you can do useful things with, like building a birdsnest, a bed, or a ukulele. One of the children mentions that plastic from packaging is a great source of oil. On the spot he invents an oil factory: he just needs to figure out how he will get all the plastic to his factory. Food can be printed, from chocolate or dough. Just add a bit of colour – plain white food does not look very nice. And drones are ideal to pick up stuff in the city. It is very handy that you don’t need a pilot to fly one. The boys and girls organise themselves. Each first chooses one of the three themes to work on. As expected, the topic of mobility sparks most kids’ imagination. Time to go creative. We enjoy a brief moment of quiet when the kids work their idea canvases. a remote-controlled robot that fishes plastic from the seas. A little bit peckish, we go for a hearty lunch. Then we will go make. Time to check in with each other. 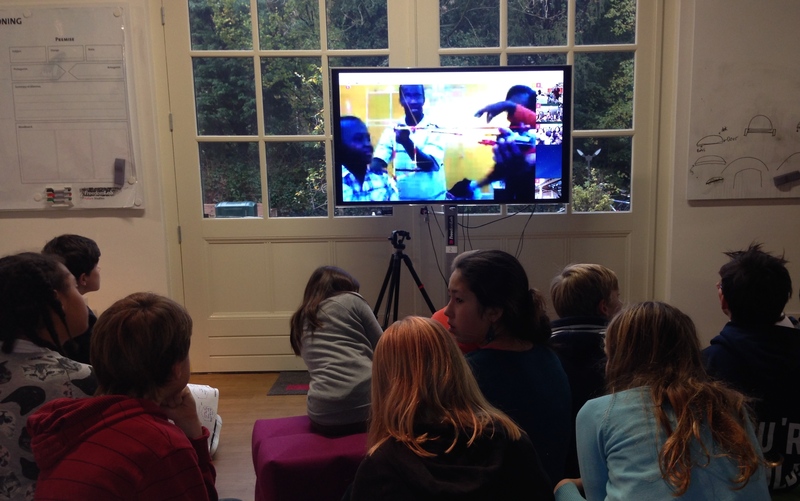 In a five way videoconference we see how the kids in Berlin, Dublin, Nairobi and Rio de Janeiro are doing. Everyone learned how we can use printers to make spaghetti. First a welcome by each of the countries hosts. Then a quick presentation of some of the prototypes that the boys and girls are working on. Now the best part of the day: building prototypes. Tables full of building materials are rolled into the main hall. Propellers, little electric motors, knex, carton, duct tape, plastic bottles, wooden wheels, solar panels, batteries. You name it – it is there. Here is where the facilitators’ real job comes in too. At times it is hard to tell who is more into it: the kids or the adult facilitators. After a couple of hours of building (interrupted here and there with a bit of running around), ±15 prototypes are ready. Whilst some of us quickly clean up the room, Emer and Marieke welcome Amsterdams Elderman for Sustainability, mr. Abdeluheb Choho. The parents, and some of the sponsors join us for the presentations. Fifteen working prototypes are presented. Flying cars, cars that hover on magnetic levitation, cars that drive on top of each other, helium balloon submarines, an in house farm, a road that doubles as a garbage removal system named the Sliding Street, just to name a few. Who wouldn’t want those things? Can you measure Creativity at Schools and should we try? How might we measure creativity in a way that is formative? Two clear benefits of assessing progress in the development of creativity are identified: 1) teachers are able to be more precise and confident in developing young people’s creativity, and 2) learners are better able to understand what it is to be creative (and to use this understanding to record evidence of their progress). The result would seem to be a greater likelihood that learners can display the full range of their creative dispositions in a wide variety of contexts. Some of which are definitely measurable. and which I tried to do here. This is a large subject of course and to be continued. At THNK forum again today, this time we have Clay Shirky, He is beaming in from New York via telepresence, no he’s not live, but he is on a huge screen and he’s here for us. As close to live as we can get today. If you don’t know Clay’s work, check here. Clay is also on the board of Ushahidi. He is THE authority on cognitive surplus and all things crowd sourcing. FIrst a brief summary of Clay’s Why are those people working for free? Answer: because they feel like they’re having fun. Ellen Jorgenson is up with the first question, turns out she knows Clay already, New yorkers 🙂 She wants to know in how far he would envisage that an online version of her lab Genspace is a possibility. He explains how we can concept the trade off between travel and communication. And says his conclusion is that you shouldn’t collaborate as partners on any serious endeavor without having breathed the same air. He advises Ellen not to set up a Genspace elsewhere with partners, without first sitting down together with those partners. Turns out thanks to Jillian York for connecting THNK to Clay. Next up Itai Talmi, he is making a mobile platform for people to co-create, go through a full design cycle in fact, and then gamified and his question is will this be enough shared value, the will to create? And does Clay think? Clay runs off and draws a pyramid for us, and refers to …… he says about 1% of users will jump in wholesale, and then about another 9% will comment and then the other 90% will just listen in or lurk. If the platform doesn’t produce a way to watch, it won’t fly, because you need to recruit from the other 99% to get them active. Clay’s advise, prototype and user test a version which has no gamification to find out if there is intrinsic value beyond the game elements. Otherwise you might end up with Farmville for creativity. Karim pick up on this, Is a lurker a participant? 2. the lurkers provide validation to the actives and lurkers provide – via data analysis – they provide enormous feedback to your product. For example: If you and I working together could get fewer potholes on the street! would you join. Nick Graham has a question on how to motivate / engage people for neighborhood issues. Clay: You can think of people in one of three categories, naive economists, naive politicians or naive theologians. Naive theologians: Its’ the right thing to do even if we fail. Every social network started good and small and grew, you don’t start big and mediocre! No-one gets up to spend the day wasting their time on an awful platform. The first group you recruit is wildy important. How do you not get demotivated, when a lot of people don’t seem to care. Clay: Work for those who do care, even if it’s a small group. And now we get to do Wok+Wine with Peter Mandeno, Yay!